For lovers of comic art who want a keepsake of Dynamite and Archie's landmark crossover, we're proud to offer remarks by the remarkable (Haha, get it?!) Ken Haeser! 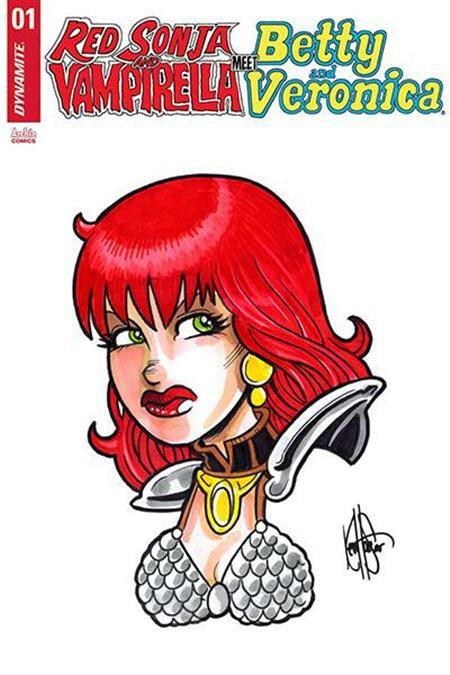 Is Red Sonja your favorite bad babe of the bunch? This portrait of the Ever-Sworded She-Devil has your name on it! Mystery, murder, and mayhem descends on Riverdale as four of your favorite comic book women meet for the first time. A string of paranormal, unsolved murders leads the vampire hunter Vampirella and her sword-wielding barbarian partner Red Sonja to the small, sleepy town where things always seem to happen… There they discover Betty and Veronica, investigative reporters for the high school newspaper, also hot on the trail of the same killer.